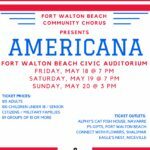 The FWBCC will begin rehearsals later this month for our spring show “Americana”. The show dates are May 18, 19, and 20th. Travel through time with us as we feature music from the early days of America, popular country tunes (both old and new), popular jazz songs, and pop music from different generations. Not only will you enjoy hearing the chorus, but our talented group of singers and musicians will also feature small ensembles and solo acts. Additionally, the recipients of this year’s scholarship award will be performing on stage Saturday night. You won’t want to miss the talent of these young musicians! Save the dates now. Tickets will be on sale online and at ticket locations approximately 3 weeks before the show.